Let's start with the sale since these booties are included! These come in a couple different colors, but I'm wearing the "French Taupe Suede." They are definitely more greyish taupe in person which I love. Another pair of booties I wear ALL the time are these and are also included in the sale at 33% off. These also come in three colors of which I have the black and taupe. They are perfect for everyday-wear. Click HERE to shop the sale where there are a ton of items up to 40% off! Lots of booties, sweaters, scarves, and other fall staples. Tons of great gift options too! Let me know if you all want me to round up my favorites or other items I've posted about that are on sale now! 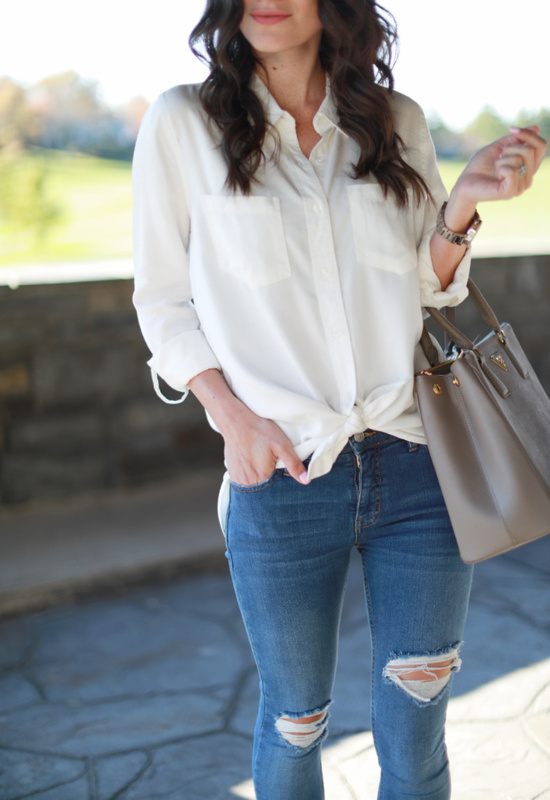 Last is this white button-up and OMG guys! It's SOO great! It's tunic style, but I decided to tie the bottom for a little extra flare. The quality of this top is top notch-I promise! I was so impressed when I took it out of the bag. It'll be on repeat under vests, scarves, even cardigans. Also a great work top to tuck into a skirt. All around great top!